"I have never in all of my traveling experience received such service." Robyn Ayers spent the last week at Walt Disney World checking out all of the new enhancements and attractions that have been recently introduced to this magical property. Today marks the 6th and final day of Co-Owner Mike McHugh's workation at the beautiful Azul Sensatori Jamaica. Co-Owner Mike McHugh spent his 5th day at Azul Sensatori Jamaica with Karlin and Ardan. Co-Owner Mike McHugh spent his fourth day at Azul Sensatori Jamaica doing site inspections and enjoyed dinner at Beaches Negril. Co Owner, Mike McHugh enjoys his third day in sunny Jamaica with his daughter, Karlin and his son, Ardan. Read on to hear about their visit to the beautiful Beaches Negril. Co Owner Mike McHugh, his daughter, Karlin and his son, Ardan enjoyed their second day at the beautiful Azul Sensatori Jamaica. Co-Owner, Mike McHugh, travels to Azul Sensatori Jamaica with his daughter, Karlin (13) and his son Ardan (9). Dream agent Lynda Hower traveled to Sandals Emerald Bay to check out the beautiful beach and new additions to the resort. Mike and Jen enjoy their last full day in the beautiful Turks and Caicos. Dream Makers Vacation Services earns five awards at the 2013 STAR Awards. Mike and Jen arrived at the 2013 Sandals & Beaches STAR Awards at the beautiful Beaches Turks & Caicos. Read about their first day. Sandals and Beaches Resorts are the leading resorts in the Caribbean. 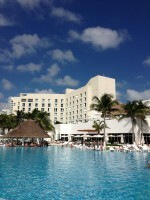 Their luxury all inclusive resorts offer something for everyone. The 2013 Cyber Sale is a great opportunity to save money on a new Sandals/Beaches reservation, reserve by 11:59 PM EST on 12/2/13 with your dream agent to take advantage of the discounts. Today marks the last day in paradise with Dream MakersVacation Services at Moon Palace Golf and Spa Resort, with time at the Spa and exploring the resort. Read on to find out about the spa, golf and the prestigious award our agency received. Dream Makers Vacation Services co-owner Amy and Dream Agent Robyn spent the day visiting one of their favorite resorts in Cancun. Read on to hear about this wonderful resort.